Satellites such as the Kepler have been working overtime to uncover hundreds of new planets in our galaxy. But how did we first discover the planets in our local volume of space? Here are the stories of how astronomers living hundreds of years ago discovered each planet in our solar system. 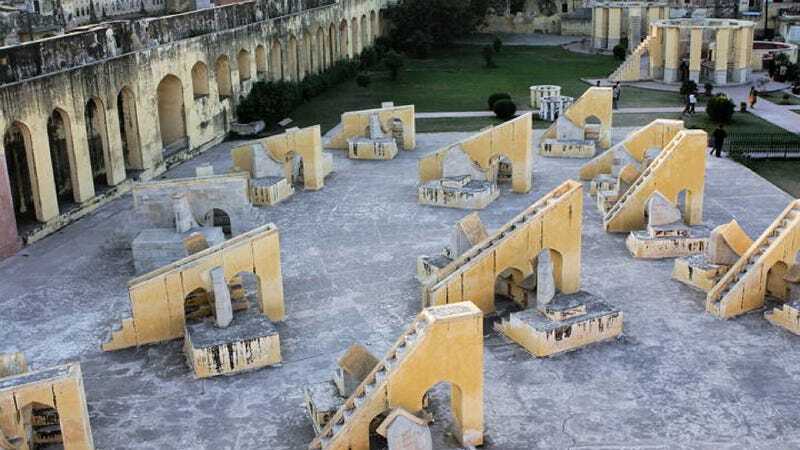 Photo of the 18th Century Jantar Mantar observatory in Jaipur, India, by Norman Koren. The innermost planet in our solar system, Mercury orbits our sun between just under 70 million and 46 million kilometers. Ancient astronomers knew of the planet's speed around the sun: Assyrian astronomers associated it with gods such as Nabu, the scribe and messenger to the gods, while the Greeks named the body Mercury, the messenger of the gods. The association is apt: the planet has a short year of 88 days in all. In 1631, astronomer Pierre Gassendi first observed Mercury making a transit across the sun, and just a couple of years later, another astronomer, Giovanni Zupi discovered phases, indicating that the planet orbited the sun. Other astronomers followed, making incremental discoveries along the way: Italian Astronomer Giovanni Schiaparelli observed the planet, and concluded that Mercury was tidally locked with the sun. More discoveries came during the modern era of space exploration: much more about the planet has been found recently. Soviet scientists first used radar to study the planet in the early 1960s, while scientists at Puerto Rico's Arecibo Observatory Radio Telescope discovered that the planet in fact rotated once every 59 days, rather than 88 as previously thought. In 1974, Mariner 10 first visits the planet, making several passes, mapping the surface, and in 2008, the MESSENGER satellite marked a return to the planet, where it's currently in orbit. The second planet in the solar system, Venus is the brightest of the planets as observed Earth. As a result, it's been studied since ancient times, with the first records coming from the Babylonians, who named the planet Ishtar. 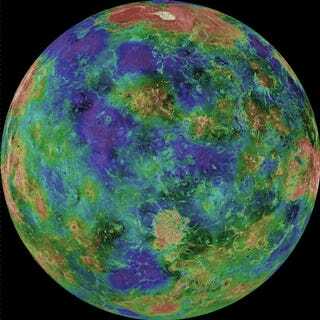 The Romans viewed Venus as the goddess of beauty, while the Mayans believed that the planet was the brother of the Sun. In 1610, Galileo Galilei observed phases of Venus, confirming that the planet did indeed orbit the sun. Due to the planet's thick atmosphere, observation of the surface wasn't possible until the 1960s, but many believed that Venus harbored life, due to the planet's similar size to Earth. In 1958, radar imagery found that the planet's surface was hot – inhospitably so. Mankind was about to get a closer look. The first attempt, the Soviet Union's Venera 1, launched in 1961, failed, but Mariner 2, launched by the United States, succeeded in a flyby confirming the planet's temperature and that it lacked a magnetic field. A new Soviet mission, Venera 4, successfully reached Venus and sent back information about its atmosphere before it burned up during entry. Several additional probe followed: Mariner 5, Venera 5 and 6, before Venera 7 successfully landed, becoming the first manmade object to land on another planet while Venera 8, landed two years later. Both were destroyed by the planet's heat and pressure, but the Soviet Union continued to send probes: 9 through 12 took pictures and gathered information on the planet's geology. NASA also continued to send probes: Pioneer 12 orbited the planet for 14 years, mapping the surface, while Pioneer 13 sent several probes down to the surface. Earth has been continually observed by humanity as long as we've been around. But, while we knew we stood on solid ground, the true nature of our home took a little while longer to figure out. For many centuries, humanity believed that Earth wasn't an object such as those that they observed above them: everything was thought to revolve around us. As early as Aristotle, philosophers had determined that Earth was spherical by observing its shadow against the Moon. Mikołaj Kopernik – known as Nicholas Copernicus posited a Heliocentric view of the solar system as early as 1514. Titled De revolutionibus orbium coelestium (On the Revolutions of the Heavenly Spheres), the book was first published in 1543, challenged the conventional wisdom of the day. The theory was controversial, but was followed up by Johannes Kepler with his three volume work, Epitome astronomiae Copernicanae (Epitome of Copernican Astronomy). Kepler had devised three laws of planetary motion: "Planets move around the Sun in ellipses, with the Sun at one focus", "the line connecting the Sun to a planet sweeps equal areas in equal times" and "the square of the orbital period of a planet is proportional to the cube (3rd power) of the mean distance from the Sun in (or in other words—of the "semi-major axis" of the ellipse, half the sum of smallest and greatest distance from the Sun)". These laws helped define the motion of the planets and allowed us the first real idea that our solar system was vastly different than previously thought. Kepler's theories weren't popular at first, but eventually caught on in Europe. At the same time that Copernicus was publishing his views, Ferdinand Magellan's expedition was able to circumnavigate the globe in 1519. However, it wasn't until October 24th, 1946 when we first got a look at our home world when the first picture of Earth was taken from a modified V-2 Rocket fired from the White Sands Missile Range in New Mexico. The blood-red fourth planet of our solar system has long been associated with the Roman God of war, bearing the same name: Mars. Where many people thought that Venus might very well enjoy an earth-like atmosphere, there were similar thoughts about Mars. Most notoriously, astronomer Giovanni Schiaparelli examined the planet through a telescope in 1877, describing a number of features, which he described as Canali. The mistranslated word was understood to mean that he had discovered Canals on Mars, and by extension, people assumed that they were artificial. Twenty years later, another astronomer, Camille Flammarion, further identified the features as artificial, and the general public generally assumed that the planet could support life. Undoubtedly, the public's perception led to the rise of a number of Mars-oriented SF novels, such as The War of the Worlds, by H.G. Wells, and Edgar Rice Burrough's John Carter series. Advances in telescopic technology that came later allowed for new observations of the planet. Astronomers were able to measure the temperature of the planet, determine its atmospheric content and it's mass. Throughout the 1960s, the Soviet Union attempted to send eight probes towards Mars, each resulting in failure, although several additional orbiters that followed in the 1970s were successful in orbiting the planet. NASA would have poor luck with the Mariner 3 mission, but Mariner 4, launched in 1964, successfully flew by the planet, taking readings as it did so, revealing a dead world. Mariner 9 would later orbit the planet, further adding to our knowledge of the planet. Where those missions were the scouts, the Viking missions represented the initial invasion: On July 20th, 1976, the probe touched down on the planet for an unprecedented mission that would last for until 1982. Viking 2 followed shortly thereafter, landing in September 1976, remaining in operation until 1980. Despite the mission's success, it wasn't until 1997 that the Mars Pathfinder mission successfully landed on Mars, the first mobile rover to be landed on a planetary body. A follow up mission, the Mars Climate Orbiter, failed due to human error, and several additional Mars Probes failed as well. It wasn't until 2004 when NASA launched the Mars Exploration Rover Mission with the Spirit and Opportunity rovers that a successful landing was made. The rovers outdid everyone's expectations, and it wasn't until 2011 that their missions were closed down. In 2012, NASA successfully landed the Curiosity Rover, which landed on August 6th, 2012, where it has begun to perform its duties. The largest planet in our solar system, Jupiter has long been watched since ancient times. It helped guide the Chinese 12 year cycle, and the planet was named for the king of the Roman gods. It also provided a big target for early astronomers. Galileo was the first to observe Jupiter's four major moons, now known as the Galilean Moons: Io, Europa, Ganymede and Callisto, named for Zeus's lovers. Astronomer Robert Hooke first discovered a major storm system on the gas planet, and it was confirmed by Giovanni Cassini in 1665, believed to be the first sightings of Jupiter's Great Red Spot, which was later formally recorded in 1831. Without an underlying land mass, the storms of Jupiter are free to rage on, and the feature has remained on the planet since. Astronomers Giovanni Borelli and Cassini, using orbital tables and mathematics, discovered something odd: Jupiter, when in opposition to Earth, appeared to be seventeen minutes behind their calculations, lending the indications that light was not an instantaneous phenomenon. As observations advanced in the 1900s, other discoveries were made: While using a radio telescope to study the Crab Nebula between 1954 and 1955, astronomer Bernard Berke was hampered by interference from one part of the sky, and eventually found that Jupiter was emitting the waves as part of the planet's radiation. In 1973, the Pioneer missions became the first probes to fly past the planet, taking a number of close-up pictures. In 1977, two space probe missions were launched from Earth: Voyagers 1 and 2, designed to explore the outer planets of the Solar system. They first reached Jupiter two years later: Voyager 1 arrived in March 1979, and Voyager 2 arrived on July 1979. Both uncovered a wealth of new information about the planet and its moons before they left, uncovering a small ring system and a number of additional moons. Other robotic missions have since followed: the Ulysses mission arrived in 1992, the Galileo probes orbited the planet in 1995, Cassini flew past in 2000, and New Horizons passed by in 2007. In 1994, scientists observed an astonishing event: a planetary impact, when the Shoemaker-Levy comet crashed into the Jupiter's southern horizon, leaving enormous impact scars in the planet's atmosphere. Currently, there are efforts underway to examine Jupiter's moons, thought to be the next best candidates for life. Our system's sixth planet from the Sun is possibly one of the most striking, and is the last classically recognized planet: the Romans named the planet for their God of Agriculture. However, it wasn't until Galileo turned his attention to the planet in 1610 before the planet's dominant feature was uncovered when. While he studied the planet's features, he believed he'd uncovered several orbiting moons. However, it wasn't until 1655, when Christiaan Huygens, with a more powerful telescope, discovered that the feature was actually a ring that encircled the entire planet. Shortly thereafter, he uncovered the Saturn's first moon, Titan. During his own observations, Giovanni Cassini, in 1671, uncovered four additional moons: Iapetus, Rhea, Tethys and Dione and a gap in the planet's rings, leading him to believe that the ringswere made up of smaller particles. In 1789, German astronomer William Herschel noted two additional moons: Mimas and Enceladus, and over the next hundred years, two other satellites were found: Hyperion, in 1848, and Phoebe, in 1899. As NASA began to explore the outer planets, Saturn would first be visited by the Pioneer 11 mission in September 1979, taking a number of pictures. The twin Voyager probes would come next, in 1980 and 1981, taking high resolution pictures. The planet became a divergent point for the pair: Voyager 1 used Saturn to arc out of the Solar System, while Voyager 2 was directed to Uranus. The planet wouldn't be visited again until 2004 with the Cassini mission, which orbited the planet and studied its moons, where it remains today. The seventh planet, Uranus, is hard to detect without the aid of a telescope, and thus, the planet doesn't have the same long history as its other neighbors. Watching the skies in December 1690, astronomer John Flamsteed first noted the planet, but identified it as a star, which he named 34 Tauri. It wasn't until March 13th, 1781 that Herschel first believed that the star that he was studying was a comet. It wasn't until he began to study the object's orbit when he found that it was nearly circular, leading him to believe that it was in fact a planet. Herschel named the planet Georgium Sidus, in honor of King George III, but the eventually the planet was named Uranus, after Chronos. It's discovery was sensational, the furthest known object in the solar system. In the 19th century, astronomers noted something odd about the planet's orbit: it didn't quite follow mathematical theories, and it deviated from its course. It was clearly being influenced by something further out in the Solar system. The planet's most unusual feature is its orientation: rather than rotating like the other planets in the system, Uranus rotates on its side, with its rings and moons orbiting in bulls-eye pattern. The underlying reasons for this are unknown, and have at times been attributed to a planetary collision. However, in 2009, members of the Paris Observatory theorized that a moon in the planetary disk, formed while the planet was in its infant stages, could have made the planet wobble. In 1986, the Voyager 2 probe passed by Uranus, examining the planet's atmosphere and discovering a number of additional moons and the planet's ring system. It was the first and only probe to reach the planet, and at this point, no further missions are planned. The last ‘official' planet in our solar system is Neptune. Orbiting 30 AU from the Sun, it's the first planet to have been discovered through mathematics, rather than direct observation. Astronomers studying Uranus found that the planet was deviating from their predictions, and attempted to uncover the problem. The planet's orbit was already known to have been influenced by the other major bodies in the Solar System, but even with the calculations at hand, Uranus was defying expectations. In 1835, Halley's Comet reached its perihelion slightly later than predicted, leading astronomers to believe that there was an additional body in the system that was influencing Uranus. Astronomers began to look further out for something that would explain the planet's movements. Astronomers in both England and France began to crunch the numbers: John Couch Adams and Urbain Le Verrier. Between 1843 and 1845, Adams worked out the calculations, but was rebuffed by the Royal Astronomical Society. Le Verrier found a similar reception, and turned to Johann Gottfried Galle, who, following Le Verrier's instructions, discovered the new planet exactly where it was predicted to be on September 23rd, 1846. The next month, an English astronomer discovered Neptune's moon Triton. The solar system instantly doubled in size with the discovery. Neptune would be visited by the Voyager 2 probe on August 25th, 1989, where it took readings of the planet, and was directed to examine Triton, where it came very close to the planet's atmosphere and fellow moon Nereid. At the same time, it was discovered that the planet was extremely warm, putting out more heat than it received, and that it featured a turbulent atmosphere with a ‘Great Dark Spot', similar to Jupiter's ‘Great Red Spot'. From Neptune, Voyager 2 has since left the Solar System, where it continues out into deep space. The history of the discovery of the solar system is in and of itself an interesting way to look at the history of science, and of humanity's understanding of our closer neighbors. The study of our planets has changed how we look at the world around us and recognize our place in the universe.